I've always liked the look of patterned blades, like the ones made by the vikings. However, I know very little of the process involved in making these, and of there effectiveness quality compared to plain steel blades. I have also heard of damascus blades; are these the same thing, and if not, how do they differentiate? Lastly, aside from the vikings, did any other cultures utilize this tecnique in their blades? The Norse made their swords out of strips of iron and steel forge welded together. The primary reason was because steel with a good carbon content for holding an edge was harder to make than wrought iron and rarer to come by. Often the center of the blade was forged out of iron and low carbon steel welded together with an outside border of higher carbon steel welded to the edge. Due to the intricate patterns that were found in some blades, it would be ridiculous to claim that they didn't also intend to make it decorative. I may be wrong, but I think that most swordsmiths who made blades with a steeled edge before the 11th century probably used much the same techniques. The process seems to have become much less common after steel with a adequate carbon content became easier to make in volume and the blade no longer had to be build up out of varying qualities of steel and iron to stretch out the supply of medium carbon steel. Slightly out of my area here, but I believe the Romans were using the method for their gladii/spartha in the 3rd/4th C and suspect it was learned from the german tribes, it was certainly used for decorative purposes by the Saxons and the Vikings as there was no reason for it to be made in such a complicated way and breadth of patterns for any practical reason. Terminology can be a little bit of personal choice here but roughly as follows. Damascus steel is either layers of steel/iron or steel typeA/steel typeB forge welded to create layers of maybe 150-300 layers to a blade thickness and was in fact the standard way of turning iron into steel in a cottage industry way. This happens by a carbon take up by the iron from the fuel in in the fire but happens to a very shallow depth, so you have to take that carbon impregnated surface and move it to the centre of the iron billet and so bring the carbon in by folding. But you have to do this loads of times to make sure there is a distribution of carbon throughout the billet. Above about 300 layers the layers become so thin that the carbon will start to internally migrate between layers and so bring up the carbon level of all of the iron and viola - steel. Below 300 layers and you get a wood grain effect of the higher/lower carbon materials, above this and you get a pretty homogenous steel. In modern times this is done for visual effect and a better blade would be made by buying your known grade steel from pittsburgh and using it as is; forge welding is only likely to degrade the steel from this point on, but certainly not make it better. Damascus steel may also be something called Wootz steel, that is a combination between iron and steel with very high carbide content and so increadibly hard and resilient and also has a wood grain/streaked effect, there a few makers who make their own Wootz, but it is not commercially available. Talking about a London time line, pattern welding seemed to die out at the end of the Viking age (mid 11th), but damascus seemed to keep going in a decorative way for another couple of hundred years or possibly more. However the process of making steel by folding the iron continued up into the industrial revolution and there is in fact a folk song called Matty Groves that is I believe 18th C in origin and it has the lyric line "For you have two fine beaten swords and I not a pocket knife" and I would personally take the line 'two beaten swords' to refer to folded, but that is speculation. To start it's important to know that all early iron was folded to purify the metal from slag. This when polished already shows as patterns in the iron, depending on whether the blade is piled in thickness, or in width direction. Later in the iron age, people started combining irons of different quality, f.e. by sandwiching harder iron or steel between softer iron layers, as well as other ways to combine the two. By the end of the iron age, there are examples where piled layers of different types of iron were used to create linear patterns in the center of the blade. From the early 3rd century AD, there are several blades (Denmark and UK), that show the classic torsion bar patternwelding. This became common standard in the early medieval period. As for the quality, it's not so much the patterns that make the quality, but the steels that are used in them and how they are heat treated. There are patternwelded blades that contain virtually no carbon f.e. It could be assumed that the layering of low and high carbon in other blades help prevent the blade from breaking, if the tempering isn't done well. The downside with having non hardened iron in your blade is that if you bend the blade, there will always be some residual deformation left after you let it go again. So it does make sense to step to fully hardened high carbon steels once that becomes more available, and they can control the tempering more accurately. Then the blades will return fully straight after bending (unless you go too far). I don't know how far that can be backed up with actual archeological evidence though. Your last question re. "Did anyone else use this pattern-welding technique besides the Vikings." It seems most swords found in Norse countries are of Frankish production, and the Frankish swords were indeed pattern-welded at a very early date. It appears that the Franks even supplied some arms to the Romans, as their skill in bladesmithing was in great demand. Most Anglo-Saxon blades also appear to be Frankish, with pattern welding up to maybe the 10th century. This subject has been kicked around a couple of times on the knife making forums that I post too. Although there is a bit of disagreement on the subject, the metallurgists on these sites hold that carbon migration in steel is rapid enough to cause an homogenous carbon content in a billet of steel by the time it has been folded several times and welded together even a very low layer counts. They hold that the patterning is caused by the difference in trace elements in the alloys which migrate much slower than carbon. They site "Steel Metallurgy for the Non-metallurgist" by John D. Verhoeven published by ASM International. Another thing to remember about forge welded steel is that every fold and weld gives a opportunity to created a defect in the billet, such as a cold shut or an inclusion, which will weaken the finished blade. It is easier to forge a strong blade from a solid billet of steel than from billets of steel that had to be forge welded together first. I too am a fan of the ornamental aspect of patterned steel. Those interested in the history of Western swords should at least consider the fabrication process and what it could have done (in an optimal case) to improve the overall qualities of early iron/ low carbon steel blades. Before the era of large blast furnaces and Catalan style forges, piled forge construction probably was the best improvement to wrought iron for purposes of making a stronger material that was moderately hardenable through tempering. The effects of working smaller rods and strips over coal or charcoal tended to convert wrought (soft) iron into at least mild (carbon content on the order of 0.3 to 0.5%) steel. Surface carbon could have gone higher if the rods were heated in an organic material. (Heating with organic matter plus the use of ores with natural alloy elements was part of the secret to wootz or cruicible steels' success.) Once you weld all of those rods and strips together with a quick team of strikers at the anvil, the carbon does migrate, and should have improved the overall "spring tempering" qualities of the iron/ steel. Verhoven's research illustrated through testing that period pieces (several Russian bullat, some wootz, etc.) had overall structural strength and properties similar to mild steel. In medieval era that was better than average available material. Between the beauty of patterns and above average mechanical properties, I'd say it deserved legendary status at the time it was commonly done. Sometimes I wonder if we are not missing the possibility that some of these older wrought iron swords were shallowly carburized and hardened, and the hardened material has since corroded off, giving us an incomplete picture of the metallurgy of these iron/piled blades and their characteristics. The higher carbon content of the hardened skin would make it even more suceptible to rust than the iron underneath. Likely the change from patternwelded to a monosteel blade happened primarily due to the expense involved in making a patternwelded blade. The time, skill, and labor involved in making a patternwelded sword would likely mean the monosteel blades were much easier to produce. There was a consistancy to the new monosteels that was not possible before. Roughly the same quality, but much cheaper to produce, without all the highly skilled labor involved with patternwelding, or the inherent chances of failure due to bad welds... It is no wonder patternwelding all but died out by the 12th century. I do not think the patternwelded blades were inferior in any way, except for the labor necessary to make them left them too valuable for any but the richest to own. The difference between patternwelding and damascus steel would seem to be how far it was taken. 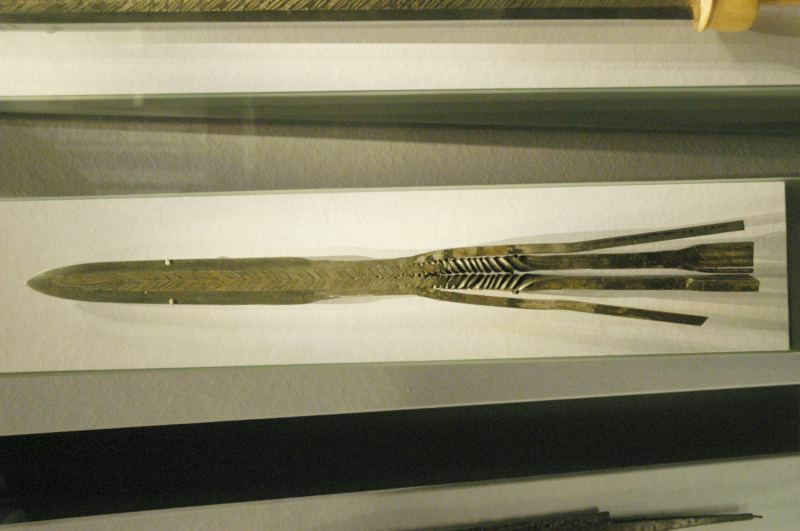 With damascus blades, the layers of the steel roughly follow the shape of the blade, possibly enhanced by 'upsetting' the flatness of the layers, as seen in the ladder pattern. True patternwelding involves taking these basic flat layers and twisting the bars, then welding them to others, with the edges being very high layered top quality steel welded to the body. 12 or more bars welded together into a blade is not unusual. This allows the higher quality steel to be where it needs to be, on the edge, while the body of the blade can be made of softer, less expensive metal. Once a cheaper, faster way was found to make quality steel (and it would be most interesting to know what process it was), there was no need to go to all that trouble unless the costumer wanted and could afford it. It depends on who's in the conversation. I too tend to go with verified scientific testing but there are those who are devoted to a more traditional way of thought. Usually you hear some arguement that if the carbon content becomes homogenous then how come welded wire damascus shows a pattern when it all starts out the same steel. The people who feel this way hold that if the carbon moves as fast as those such as Verhoeven claim the carbon lost at the surface of the wires would be replaced by carbon from within the wires and there would be no pattern. I don't want to classify these people as a bunch of troglidites who resent being confused by facts but there are those out there who cling to their belief that the watering in pattern welded billet made up of plain steel is caused by the difference in carbon content. ... if the carbon content becomes homogeneous then how come welded wire damascus shows a pattern when it all starts out the same steel.. Depending on how cable welding is done, there are different possibilities. I have a "cable damascus" knife in my pocket right now which has most of its pattern attributed to slag inclusions at the weld areas. Some makers dismantle the cable and re-weave strands of different alloy material back into it before forging it. The later with generous flux and minimal inclusions seems preferable. In the case of better "pattern welded" billets, the more visible and attractive (at least in my opinion) variations are normally due to alloys other than carbon (chromium, vanadium, nickel, etc.) that don't quickly migrate between layers during the forging and folding processes. This picture was taken at Moesgard Museum (Denmark). It shows the process of making a herring bone patterned blade. This is to illustrate how many swords from the Illerup find were built a few centuries before the viking period. Lastly, aside from the vikings, did any other cultures utilize this tecnique in their blades? Pattern welding seems quite widespread. Outside of Europe, I know of it being used in the Indo-persian region, down in the archipelagos of south-east Asia, as well as in the Himalayas (Tibet and Bhutan). I wouldn't be surprised if it was used in other places as well. That is a fantastic picture, thanks for posting it! Thanks so much for all that info! I'm a visual person, so that picture really helped.